For thousands of years the women of Africa have known the secret to beautiful skin, shea butter! 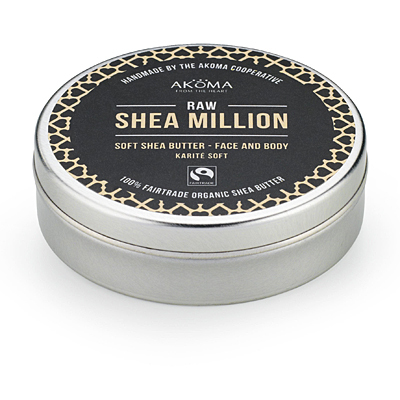 Shea Million is a fantastic fairtrade and organic, face and body moisturiser made of raw shea butter, brought to you by Akoma Skin Care and the women of the Akoma Cooperative Multipurpose Society. Award-winning star of Twenty Twelve and the Royle Family, Jessica Hynes, recently visited the Akoma Cooperative with her nine year old daughter Bee, to find out how shea butter is made and to learn about the benefits which come with Fairtrade for the group of women involved. Now Jessica is hoping to raise awareness of the Akoma women and others like them this Fairtrade Fortnight by going bare-faced on International Women’s Day on 8th March, wearing nothing but the Akoma Shea Millions. Jessica added “The money they get from working together goes to build a strong, healthy community, for the good of the wider group not individual gain. These are values I really believe in and I’m very privileged to have witnessed them. I hope you will to and please help spread the word by sharing this article across your social media networks. Their Fairtrade Raw Organic Shea Butter naturally contains vitamin A and E. Vitamin A is important for improving a number of skins conditions including, blemishes, wrinkles, eczema and dermatitis. While vitamin E is a common anti-ageing ingredient that protects your skin. It is also perfect to take away with you when travelling or on holiday to take care of your skin after you have been out in the sun. Try it for yourself and support the women of Akoma by buying Shea butter at Akoma Skin Care.